The New Africa: Petra Trust Launches Savings Booster - A Groundbreaking Financial Product That Allows You to Turn Part of Your Income Tax into Personal Savings. Petra Trust Launches Savings Booster - A Groundbreaking Financial Product That Allows You to Turn Part of Your Income Tax into Personal Savings. Accra, Feb. 4, 2016 –Petra Trust today announced the launch of Savings Booster, a groundbreaking savings product that enables individuals to boost their savings by shaving off a part of what they would have paid as income tax and adding it to their savings. 1. Just as your employer pays your income tax on your behalf, Savings Booster allows your saving contributions to be paid on your behalf by your employer, enabling you to save consistently and effortlessly. 3. It contributes to the long-term savings pool of the country, and by so doing helps provide the much-needed mid-to-long term investments required to transform our economy. ” Said Mr. Fynn. In addition to these, Savings Booster provides safe investment and great returns, with after-tax returns higher than the yield on 91 day Treasury bills. Additional safety is provided by the fact that it invests in a Tier-3 scheme regulated by the National Pensions Regulatory Authority. It requires no minimum deposit, and provides easy tracking of your savings with 24/7 access to your balance online. SMS notifications are sent with each credit to account and statements are emailed every quarter. Mr. Chris Hammond, the Deputy Managing Director of Petra Trust also added that ‘Another key feature of Savings Booster is that the funds in your account can be used as collateral, allowing you to easily secure a loan or mortgage without disrupting the growth momentum of your savings. Petra Trust is the leading independent corporate trustee company in Ghana. Led by investment practitioners with decades of asset management and finance experience, Petra offers its scheme members the best opportunity to achieve a financially secure future. Petra provides a full suite of pension trustee services under the Pension Act of 2008. 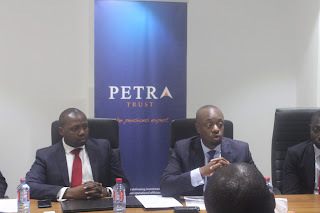 Petra Trust recently partnered with LeapFrog Investments, the specialist investor in financial services in Africa and Asia, to take advantage of growth in Ghana’s retirement industry expected over the next four years.